Gram Swaraj : How much ? 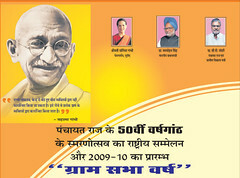 50 years and still we are talking about empowering Panchayati Raj ! And with the effort we as a nation putting in it, probably after 50 years we will be saying same.We have got very good vision but no effective action plan on it. Where Bapu's dream was India with prosperous village with Kutir Udoyg, we are forcing them to migrate to Cities in search of Jobs. By this in future there would be no village hence no need of Gram Sabha.